First it was musicians, now it’s software developers, and next it will be movie stars. The gravy train is over, folks! If you write code for a living, your career is in the crosshairs of the Web’s demand that everything digital be cheap or free. A whole generation is growing up believing that if you cannot touch it, then it has no monetary value and is free for the taking. Is this necessarily a bad thing? If we remove the economic incentive for the time-and-resource-intensive business of software development, consumers are likely to see fewer ambitious software products like Photoshop and Microsoft Office. However, I’m confident in the future that we’ll all enjoy an endless supply of Fart apps. Many people steal software because they are too stupid to know that it’s wrong, or too dumb to get a job so they can pay for what they are stealing. Though many pirates will tell you how smart they are because they’re getting stuff for free while the rest of us have to pay. It does sound smart, I guess, if you can get beyond that whole moral “stealing is bad” thing and the threat of bad karma. 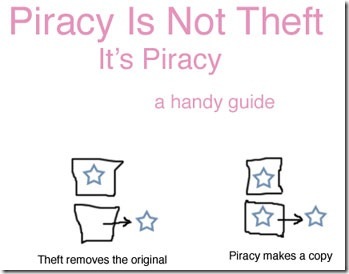 But the stupidest pirate of all is the one that asks the software maker to help them steal their own software. Dushyant was dim enough to join the CodeSmith forums on the CodeSmith website and ask, “can any one post me the serial key to trick the CodeSmith Professional 5.1.1.8242”. 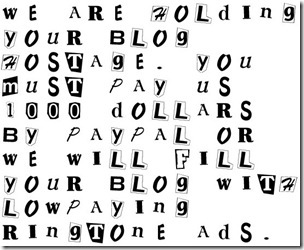 In the “old days” of typewriters, forensic scientists could match a ransom note to the typewriter that produced it to apprehend the kidnappers. This was possible because microscopic differences in the metal letters produced a “typographical fingerprint” that could be identified from any page printed on that typewriter. Today, computer printers are highly precise instruments that make it nearly impossible to distinguish between pages printed on the same brand printer. However, an article in USA Today describes how many color laser printers leave microscopic yellow dots on each printed page to identify the printer’s serial number and ultimately, you. Although PC software piracy declined in many countries in 2007, piracy increased in fast-growing PC markets, resulting in an overall rise of piracy from 35% to 38%, and dollar losses that increased by $8 billion to nearly $48 billion. The annual study was conducted by IDC and released by the Business Software Alliance (BSA). About one-third of all software installed on personal computers globally in 2006 was pirated, according to a study from IDC. This resulted in a worldwide software revenue loss of $40 billion, an increase of more than $5 billion or 15% over 2005. The software piracy rate exceeded 60% in more than half of the 102 countries studied, and exceeded 75% in about one-third of the countries.